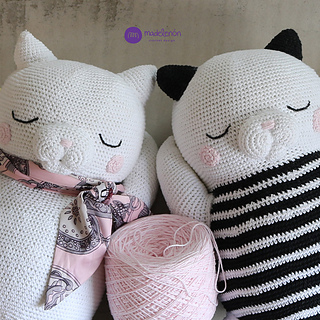 This is a crochet pattern in PDF – NOT the dolls in the picture! Let me introduce you Legna the cat, she’s sooo sleepy, cute and soft, she’s approx. 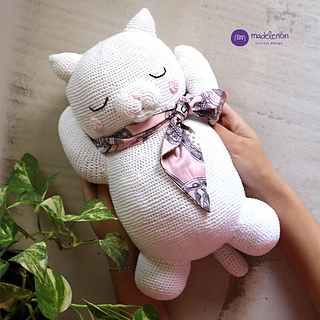 32cm long but you can make her bigger or smaller according to the yarn and hook you use. Of course, if you’ve any trouble with the pattern, don’t hesitate to ask, it’s always a pleasure for me to be helpful. I wrote this pattern in the simplest way I could. This pattern is made for those who knows basic crochet stitches such as magic ring, chain stitch, single crochet, increases and decreases. You can crochet it in the traditional way (finishing every round with slip stitch) or in spiral rounds. 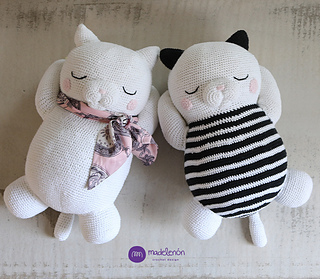 © 2018 Madelenón Crochet Desing - Soledad Iglesias Silva –All rights reserved. This pattern is for personal use only! 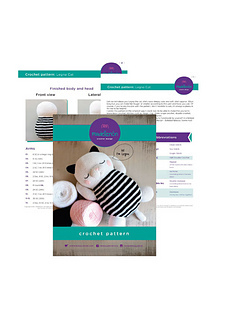 The pattern or parts of it must not be publish (online or printed on paper), alter or resold. You can sell your finished articles made from this pattern but please mention it is a desing ofMadelenón Crochet Desing - Soledad Iglesias Silva - www.madelenon.com and if it´s possible provide a link to my shop.